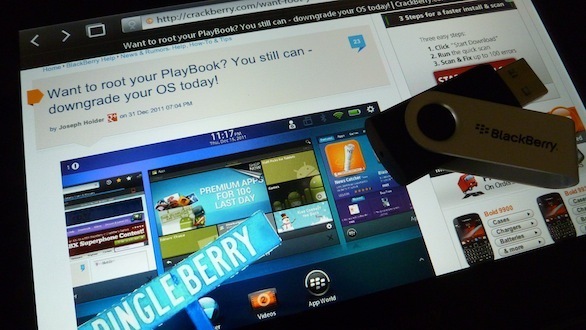 A few weeks back we saw a video sporting USB support on a rooted BlackBerry PlayBook. Well now guillem has posted a little how-to that shows off just how to get USB support up and running on your rooted BlackBerry PlayBook. You'll need a few supplies including a rooted PlayBook, a USB OTG (On-The-Go) adapter (or a Female USB A to micro USB cable and a soldering iron) and a bit of tech knowledge to get going. Keep reading to find out just how it's done! The easiest way to start is to grab a USB OTG adapter. If you can't (or don't want to get one), find a female USB A --> microUSB cable. On this cable, open the microUSB side of the adapter and solder pins 4 and 5 of the microUSB port together. The only line you really need to pay attention to is the last one as it shows where the flash drive will be mounted after it's connected. You can specify different mount points for different partitions by separating them with comas (in the example here hd6t6 and hd6 are shown). If everything goes as planned you should now be able to access the contents on the folder you selected on your drive. Keep in mind that you'll first have to create the directory for the automount to work. Also noted is that the kernel modules do produce a bus error and crash at times, however if this happens just run the commands again. So that's it! If you are bold enough to give this a go, drop a comment here and let us know what you find out. You can follow @guillemmateos on Twitter for more updates or hit up the original post for more.